And a happy DA for you. Let us know how it goes here (although no spoilers until Monday). Was enjoying this one until I put SHINGLEBACK in as one of the answers. I hadn’t heard of the word, and when I looked it up in Chambers, it wasn’t listed so I assumed the answer was wrong, threw in the towel and decided to look at the answers. 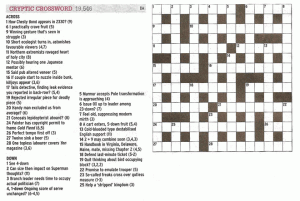 Groaned when I discovered SHINGLEBACK was indeed the answer. Pretty good one, with one really obscure word and only one (still) unexplained wordplay. And only two letters away from a pangram. Two word plays to sort out. Liked 24a and 25d. All out in a couple of hours. Only fired up google to check the Latin and the philosopher spelling. 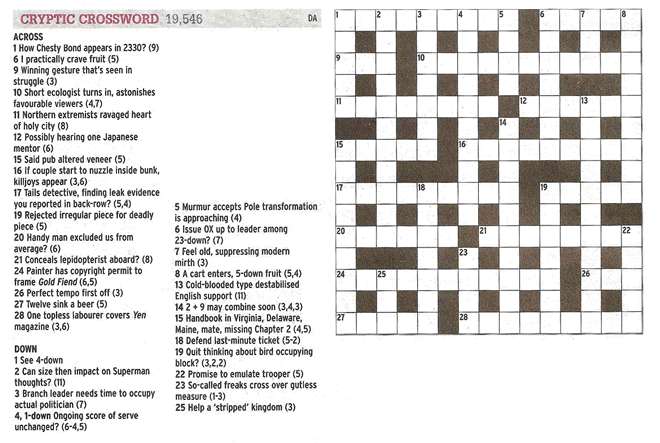 Not entirely across some of the wordplay – 1a,10a,17a,3d – but still very pleased with myself. Liked 21a, 12a,24a,5d,25d. 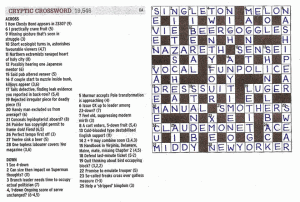 A nice crossword to work on during choir rehearsals when we have to be sitting quietly and still. All out except for 15 D. A few chuckles and wry smiles. Didn’t enjoy it as much as last week’s. Agree with nn’s comment in other thread about indicators getting weirder. Also, in striving for good surface, the syntax sometimes just doesn’t work for the wordplay (eg. 16A FUN POLICE, and 3D LIBERAL). And 23D (XMEN) wordplay was just ridiculous. 15A (VOCAL) was lame. I did like 4D (24/7) though.